Western Canada’s largest winter festival – which celebrates the region's fur trade history, Francophone culture and Métis heritage – starts this week (February 15-24) in Saint Boniface at Fort Gibraltar (along with locations/special events at The Forks and establishments in St. B). To celebrate half a century, they are bringing some new things, along with keeping all the FDV classics. 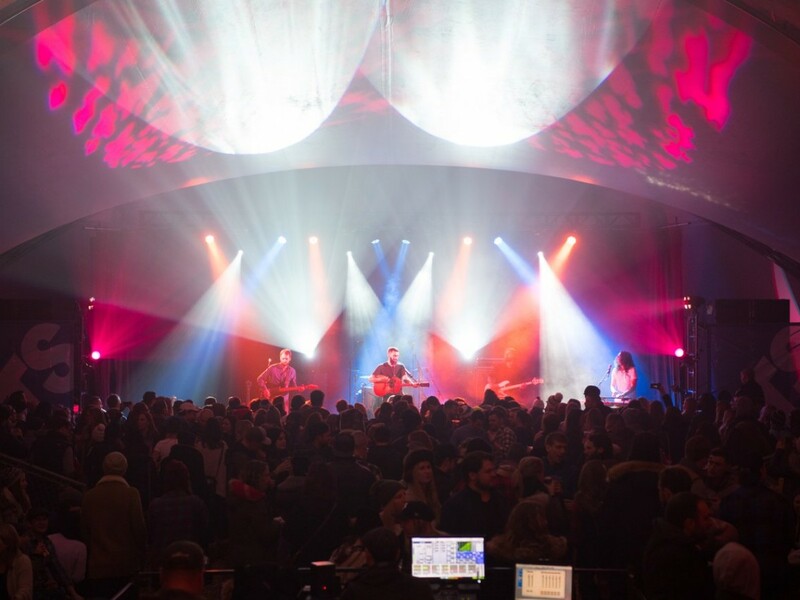 Over 150 bands, DJs and singer-songwriters hitting the tents over the course of two weekends as crowds hit the wood-chipped covered dance floors (during the days, the impromptu kids dance parties are the cutest things you’ve ever seen #snowpantsmakethebestdancepants). Historical reenactments and saucy costumed interpreters who will regale you with tales from the fur trade. And of course, all that indulgent French food and drink – including Caribou in ice glasses, all manner of tourtière, incredible chocolate carvings from Chocolatier Constance Popp and Montreal's Christophe Morel, and everyone’s favourite - maple taffy on a stick. If that’s not enough, here’s just a few of the new (or newish) events that you simply won’t want to miss as FDV turns fiddy. On Monday, February 18 at 10:30 a.m. (Bell MTS Rivière Rouge Tent) FDV will be teaming up with Manito Ahbee for a special interactive event that will teach people the meaning of Pow Wow. During this, they will be demonstrating certain dance styles, drum songs, and the symbolism and beauty of a dancer’s regalia, while everyone will also be invited to participate in a friendship round dance. It will be a great introduction to what the Manito Ahbee Festival (May 15-19, 2019) is all about, which is “a gathering that celebrates Indigenous culture and heritage to unify, educate and inspire,” where one of the many events includes one of the world’s largest Pow Wows. For the first time in FDV’s history, The Forks will serve as a permanent satellite location for FDV (which, as previously mentioned, takes place in and around Fort Gibraltar and some select Saint Boniface venues). And by satellite location, we mean a giant ice bar built right on top of the frozen Assiniboine River in The Forks’ historic harbour. Here, on weekends (Friday to Sunday, click here for hours), you’ll be able to drink cold ones in iced glasses and huge ice mugs, while taking part in much Voyageur-inspired merriment, like assembling a team on smooshing skis. Rumour has it, the bar is often populated with cute sled dogs. Speaking of dashing dogs, FDV is bringing dogsledding back this year! Ed Streeper from Streeper Kennels is bringing his world-famous team of dogs, offering people the chance to mush their way down the frozen rivers and Voyageur grounds (fee is extra from entrance ticket). On Friday, February 22, (8 p.m. to midnight) in the Snow Bar Liquor Mart tent) FDV will host the second edition of Voyageur Pride. DJs Mama Cutsworth and J. Jackson will be spinning, while you can expect an inclusive, fun and fabulous dance floor. On top of that, there will be drag/jig performance from Ryan Richard – a champion jigger whose other stage name is Miss Sandi Bay. Held inside The Dome at Voyageur Park (which is a giant inflatable dome), these dance parties allow participants to plug into one of three live DJ channels, ensuring you can let the rhythm take you there. *Please note: Admittedly, Will Smith may not still be super-fresh (he’s had some flops as of late), but the chance of he and FDV being 50 in the same year was too good not to put in this "fresh" lede.